Hi everyone! Between my several tests of pie dough, two evenings of having crêpes for dessert and a 4 layer cake, filled with pastry cream (crème pâtissière) and raspberries*, guess what ? We both have put on a little weight… So I have been making more salads, more specifically this one, perfect as a starter for a light meal ; it is both fresh and filling, and it is one that we both like to eat in winter. 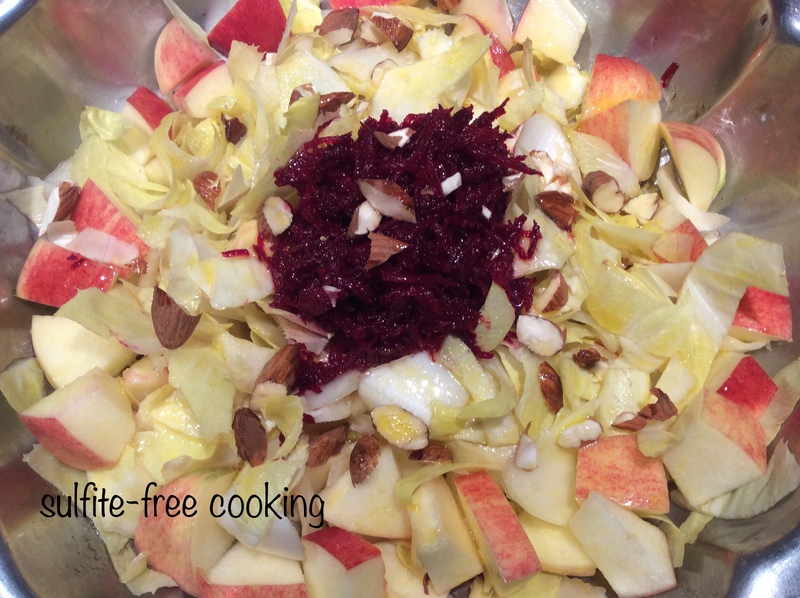 Nothing but seasonal ingredients are in there: apples, orange juice, beet, and endives. My Significant Other had never had endives before we met. If this is a first time for you, you need to know that they taste slightly bitter ; however in this salad the bitterness is lessened thanks to the added apple and fresh orange juice. Isn’t this exciting ? The more I read and learn about « real food », the more I find it amazing how it can help up stay healthy ! Note that the quantities can be changed to your personal preferences ; this is not a cake or bread recipe ! 1. Prepare the dressing by combining the TBSP rice vinegar with 2 TBSP orange juice, 2 TBSP canola oil, and the salt. 2. Cut the outer leaves of the endives diagonally. Center leaves and core go to the compost ! Cut apples into small chunks and grate beet. Chop or sliver the almonds. Add dressing, toss and enjoy ! * Here is a glimpse of the fancy gluten-free and dairy-free dessert I made for my aunt when she invited us over. Tempted ? Sorry, guys, you’ll have to wait a little: it’s going to require a lot of typing! Next vanilla or lemon French pastry cream (“crème pâtissière”), gluten-free, dairy-free, with the help of a potato masher!!! Can’t wait for the dessert! Hi Dolly, the dessert requires a lot of typing both in French and in English 😊! I have started working on it. I am glad you stopped by, I have a question for you: what would you use as a substitute for regular dairy cream in a salty dish? Here in France I buy “soy cream” which has a minimal amount of ingredients, all safe for my husband, but I couldn’t find any equivalent in the U.S. What do you recommend? Thank you for all your kind comments, Dolly. Dear Joelle, I use Tofutti Sour Supreme, which is also soy based, but you’ll need to check the ingredients. If you need cream rather than sour cream, you’ll need to look into non-dairy frozen creamers at a Jewish grocery store. There are several, and I don’t know what is available in your area. There is Coffee Rich Cream produced in the US, and then there are several Israeli brands that are better quality (and more expensive). I hope this helps! Thank you very much for such a prompt reply. Yes, this helps. Actually I need to pass the information on to my daughter who lives in New England. There is a store nearby that caters to their Jewish customers and she has been there before. Hopefully they will carry similar, if not the same, products. Where in New England? I might be able to help. I’ve just sent her a message to check the Eastside Market in Providence, Rhode Island. Are you familiar with it? Considering that my son got his doctorate from Brown, I should be! Very good store, with a nice assortment of products. They should have a choice of Pareve (non-dairy) creams. Wow, excellent! (I mean, for your son). Our daughter is still an undergraduate and looking into schools for later. She doesn’t go to Brown but has been there a few times on behalf of her research lab professor to get some things done using Brown University equipment. Don’t ask me for specifics, all I know is that she loves the research she is involved in! Isn’t this a small world? Just as I said, we are all “neighbors”! We certainly are! And I am an old lady, dear Joelle. My granddaughter is now thinking which college she will be applying to next year. Where is your daughter going to school, if she is so close to Providence? An undergraduate involved in research – that’s very impressive! She is at Rhode Island College for now. She is doing very well and is hoping to be able to attend a more prestigious school afterwards. We keep our fingers crossed for her. She is very hard-working and so enthusiastic about science… unlike me, I was into languages and literature! Wow – that’s a serious young lady you have! I wish her all the luck in the world! You should be so proud ! You see, you have to have ADHD, like Leonardo and my husband! But I am also multitasking: blogging, stuffing mushrooms, and baking muffins at the same time. That dessert looks wonderful, so colourful too. I can’t wait to read the recipe. I hope you can make it, especially if your raspberry plants are generous! Hey, not a word about my salad??? Your dear reader/co-blogger is vexed! The only experience I’ve had with salads is pushing them away, so please don’t be vexed with your “gentle reader”. He had to look up endives and has learned something new! I have to say I love how healthy, but still easy to prepare your recipe are, I see a lot of claims and statistics floating around on blogs. All too often it’s just reblogged and reiterated without any real thought. It’s one of the reasons I enjoy seeing recipes like yours, they’re the kind that can truly help people, by teaching and offering them options to help themselves heal. Your dear writer can be inept on the social side of blogging, all too often I fear, but I hope you’ll forgive me. Now, poor Jack has to brave the wet weather and plant some purple garlic, store bought so it may not grow, but I have to at least try. Take care. Thank you, I appreciate your kind words! Purple garlic is very tasty, so I wish you good luck with it.